At the end of the 19th century, fast, electric streetcars replaced horse-drawn transit vehicles, revolutionizing how people moved through rapidly-growing cities. Except for a few early dabblings in the embryonic technology of a rubber-tired electric bus, the streetcar dominated through the early 1900s, and during both world wars, provided the majority of public transit. However, following WWII, the rise of the personal automobile, a boom in the economy and the associated affluence of the population, coupled with ageing, worn-out tram systems, demanded a modern, transit vehicle to replace the streetcar and retain transit riders. Enter the trolley coach – fast, clean, quiet, and maneuverable through streets that were crowded with automobile traffic. 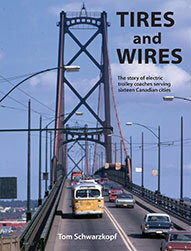 By the late 1940s, every major city in Canada had added fleets of the new electric coaches, which, thanks to their quiet, powerful, electric motors, could climb hills and accelerate much faster than the less powerful gasoline and diesel motor buses of the day. Tires and Wires tells you all about how that happened. These efficient trolley coach lines ran in Halifax, Montreal, Ottawa, Cornwall, Toronto, Hamilton, Kitchener, Windsor, Port Arthur-Fort William, Winnipeg, Regina, Saskatoon, Calgary, Edmonton, and are still operating in Vancouver. Several other cities contemplated or trialed them, and all are featured in this omnibus volume. However, a variety of factors doomed the electric coach, just ahead of the green revolution. The reasons are varied, and covered in each city’s story. Fascinating photos of each city’s system show the coaches, passengers, and in-street running, with the surroundings providing historical reference points for those interested in transportation, Canadiana, and nostalgic home-town views. For equipment and transit enthusiasts, the author has compiled complete system equipment rosters, with vehicle specifications and illustrations, along with a listing of preserved equipment. There’s a chapter for each city’s system, plus a history of the trolley coach in Canada, and of all nine coach manufacturers. Wire maps (to show the streets on which they ran) are included for every city. Hundreds of excellent photographs and illustrations, along with high-quality colour photos are included in the book. In addition, a unique compilation of late 1940s and early 1950s colour postcards featuring trolley coaches appears in Tires and Wires.